Does your son or daughter succeed in many kinds of challenging activities, but have a tough time when it comes to school? In truth, he or she may be suffering from a particular condition that hinders learning. It's known as Convergence Insufficiency (CI). CI is a condition that negatively impacts a child's ability to see, read, learn and work at close distances. Someone suffering from CI has trouble, or is entirely unable to coordinate his/her eyes at close range, and that really impacts on basic activities like reading or writing. In order to avoid double vision, they strain more to make their eyes converge, or turn back in. That might not sound all that bad, but that extra strain will often give way to an astounding amount of prohibitive side effects including headaches from eye strain, blurry or double vision, fatigue and decreased concentration, and the inability to comprehend during relatively small reading periods. With bad cases of CI, the eyes may actually turn outwards. This is what we call strabismus. You may have also noticed that your son or daughter often loses his/her place when reading, squints or tends to shut one eye, struggles when trying to remember what they just read, or reports that words they look at seem to move around on the page. CI is usually diagnosed incorrectly as ADD or ADHD, dyslexia, or an anxiety disorder. This eye problem often goes undetected during school eye screenings or regular eye exams using only an eye chart. Your child may have 20/20 vision, but also have CI, and the subsequent challenges associated with reading. But it's important to know that CI generally responds positively to treatment. 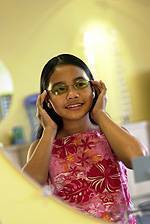 Treatments generally involve supervised vision therapy with practice sessions at home, or the use of prism glasses, which will lessen some symptoms. The bad news is that with the consistent lack of testing for CI, many sufferers aren't getting the help they require early in life. So if your child is having a hard time with anything mentioned above, speak to your optometrist and be sure to get that loved one tested for CI.